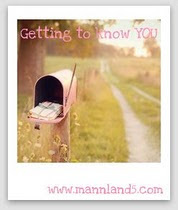 These are the Getting To Know You Questions from Mannland5. To see the others who have linked up or to link up yourself click on her button above. 1. Do you have a fetish? Does food count? Otherwise no. 3. Who was your first crush? Fonzie from Happy Days. A girl can dream, right? Must of been the leather jacket. 4. What do you think is the best manly trait a guy could have? Being a great father. Playing with the kids. Always being available for family. 5. Had to omit #5- just couldn't bring myself to write the word on my blog- I am a huge prude and proud of it!!! 6. What do you do when (you think) no one is looking? Big time- nose pick!! Can't believe I just said that- I do wash my hands- lol I am going to hit publish post before I can delete that! 7. What's the first thing you do when you go online? I always check email, then my blog. I get real excited if I have mail or if someone commented on my blog. I get ecstatic if I have a follower! 8. Summer is.....my favorite time of year. We hit the beach, stay outside and finally get to enjoy Long Island especially after the winter we have had. oooh so glad u admitted to nose picking. Following you :) Be sure to stop by and check out my giveaway!! Love your answer to number 8!! Some of your answers cracked me up!! Too cute!! Your newest follower from Getting to Know YOU!! Stopping by via MannLand5. I love your blog! I agree with being a great father. What is your favorite beach on Long Island? I know, they are all beautiful! Hi I'm here from the MannLand blog hop and your newest follower...I think the first thing we ALL do when we first come online is to check our emails. Smiles. Hope you come visit my blog and follow me too. Thanks! And I totally completely agree with your manly quality, nothing gives me butterflies like watching Brian play and talk and teach the kids.